1. EXERCIZE HEADPHONES WITH TANGLE-FREE CABLE & SUPERB ANTI-DROP DESIGN: The premium tangle-free braided cable never tangles! 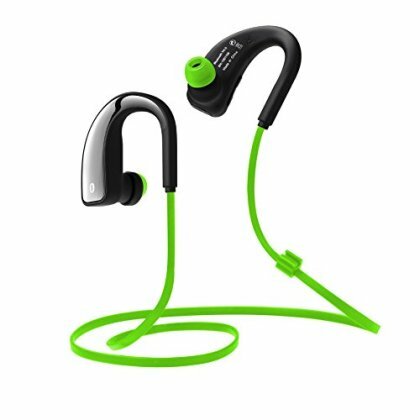 The in-ear metal earbuds are durable, sweat-proof, wear-comfortable, and does not fall off or drop easily, making this Bluetooth earphones ideal for sports, jogging, hiking, gym, exercise, and all other fitness activities. The best thing about this Bluetooth hear! 2. LATEST CVC NOISE-CANCELLING TECH & CSR 4.0 CHIP INSIDE: enjoy your favorite tunes to the max with the CHANDRAL Bluetooth Headphones! The audio is undiluted and undisturbed by noise, thus making your tunes or phone calls incredibly clear. Its HIFI sound quality with the suitable bass is unmatched by any on the market. 3. BUILT-IN MICROPHONE: these are not your average Bluetooth earbuds! You can also initiate or receive phone calls and video calls! The pack ships with extra 2 pairs of soft gel earpieces of varying sizes for a custom fit. Unlike other cheapish Bluetooth earphones, this one boasts of a long battery life with 120mAh. Available in 4 different colors. 4. UNIVERSAL DEVICE COMPATIBILITY: The CHANDRAL headphones are fully compatible with any device you can think of! It works with iPhone 6/6Plus 5S 5C 5 4S 4, HTC, iPad Mini 1 2 3, One mini, One mini 2, Samsung Galaxy Note 3, Note 2, S6, S5, S4, S3, S2, MOTO X, LG Optimus, LG G3,G2, Kindle, plus many more. 5. 1-YEAR WARRANTY; we are wild about quality! That is why we create only products that stand out through their high quality. Our Bluetooth headphones are backed up by our 1-year warranty: no hassles & no questions asked! It is a risk-free purchase - order NOW!